In the scheme of things, A View to a Kill is generally the most hated James Bond film. I personally disagree, but it isn’t hard to notice why. I liked this better than the last film, which I consider the worst Bond film, but honestly…not by much. For the most part, I’m just happy that Roger Moore is leaving the series. He has a fan base, yes, but like I’ve said, I have never liked him and don’t think he’s the best actor in the world. A View to a Kill had some good ideas, but all set on such a bad foundation. This is a pretty messy plot, but I’ll try to get it right anyway. Christopher Walken plays this fellow named Max Zorin who has a fascination, no…obsession with microchips. He manufactures them, and I guess they are real important, because he’s been selling to some people, which led to the death of a 00 agent. James Bond looks after the case, and finds out Zorin is planning to, for some reason, flood Silicon Valley in San Fransisco, which would in turn…make his microchips really valuable. So, pretty much Goldfinger without the good plot. Roger Moore is really old. It’s not that he really looks old in general as he does for James Bond. Bond gives a viewer an expectation of how Bond looks and feels, and a 58 year old attempting stunts is not it. On his own, Moore looks fine and would play a great estranged father in an ABC made-for-tv Christmas movie…but James Bond? Nah. The action sequences are technically…pretty good. I noticed I was more in tune to them than previous films, but Moore lacked that certain…believability that James Bond requires to make the film better than it is. That being said…it’s still pretty memorable. The key scenes I took away from this involved a fire in a building that James escapes from, dangling from a fire truck’s ladder that came loose while driving, the flooding of a mine shaft and numerous violent deaths, as well as a fight on top of the Golden Gate Bridge to sum it all up. All of these great scenes were introduced in the second half of the film. So I liked…half of it at least. The first half I could have done without, but it did use a lot of great spy gear, including a neat camera ring. The main problem with the first half was simply put…the plot. Any movie needs a solid foundation for the plot, in which this film clearly lacked. In Goldfinger, the plot was clearly a selfish one, but interesting – because it dealt with gold. It wasn’t just interesting, it was pretty to look at. This film took what Goldfinger introduced us to, and made a joke out of it. That used gold, this film used the concept of…a microchip that doesn’t seem to have the least bit of importance. 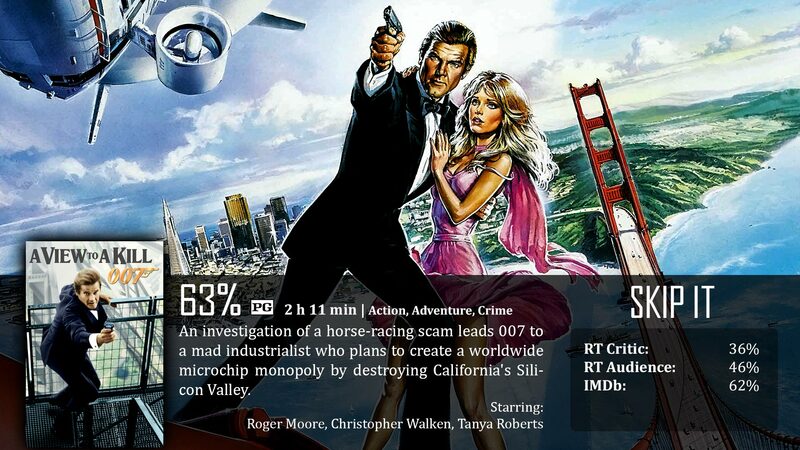 Seriously, half of the film, it just seems like the microchip is used to cheat on horse racing…so what. Is the next Bond going to go after a man who steals Skittles for a living? The danger element came later with the flooding of Silicone Valley. I’m just happy that it wasn’t nuclear missiles. It was an idea that we hadn’t yet been introduced in the series…and it was still a dangerous end game…perfect for James Bond! Now, a lot of critics make fun of the Bond girls in this film. I won’t. I’ll tell you why. Others say Stacey Sutton is a terrible actress and probably the worst Bond girl to ever grace the silver screen…I agree, but I just think – so is every other Bond girl. There has been one Bond girl that I believed actually brought something to the story, and that one was the one gunning for revenge in For Your Eyes Only. The rest of the Bond girls are usually – Bimbo robots. Useless eye candy, and for films that are so old, I can’t even distinguish the difference between them…that’s how stupid they are. However, the one girl in For Your Eyes Only and heck, even May Day in this film are set apart from the rest. Sure, May Day may be the black Lady Gaga and weird-looking as all heck, but she’s different, and she has more soul than any other Bond girl out there. Yeah…she’s the villain, but since Bond slept with her, I call her a Bond girl. A View to a Kill is far from the best James Bond flick, but as far as exiting films for main actors, this one wasn’t horrible for Roger. There were moments in the film that I actually liked, so sue me. I think I’ve picked up a trend in your reviews, and I’ve made a mental note. Never Watch the Roger Moore Bond Movies.